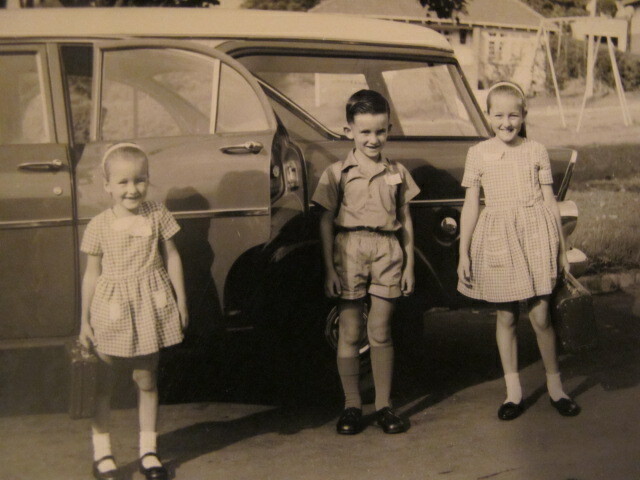 Off to school in the Holden.. before we had an awareness of what was cool and what wasn’t. We all started at Woodlands Infants School and then moved onto Southlands Primary. I loved Mrs Chantz in Class 1. She was so kind and her writing was really round and neat. There was a girl called Cornelia who loved to play with my long hair and I never complained. Brett Taylor liked me and kept leaving money in my little wooden desk. I was happy to keep it until Val found out and I had to give it all back. That was the end of a deep relationship. Southlands Primary was a 1 1/2 kilometre walk from our house and we always made sure that the trip there and back was eventful. We picked cherries, went in and out of people’s gardens, threw stones on roofs and sat somewhere to eat/get rid of any left over lunch. We preferred to walk to school, rather than be taken in the red Holden, so we tried our hardest not to be late. There was nothing more embarrassing than chugging and spluttering up that hill right where the kids were lining up to go into assembly. We would all slouch down in the back seat hoping not to be seen but knowing that we were definitely being heard. “Marbles” was my favourite season. I beat all the boys and I would go home with my bag full and my heart happy. We played during every tea break, lunch time and until the sun went down. On our way home one day, the time just got away and I got carried away with my winnings. It was almost dark when I heard Val shouting my name from the top of the stairwell that joined two roads. I knew I was in trouble. I grabbed my marble bag and my small brown suitcase and ran as fast as my little legs would go up the 100 stairs. I got pushed into Pappa’s badly painted red and blue VW Beetle, and all the way home I was making up stories, but I knew she wasn’t listening. I rushed inside the house, holding my behind, saying, “ No Mommy, No Mommy.” That was before the brush had even found its target. I knew I deserved it. Then there were always after school “roughts” (fights) to attend. As the school bell rang someone would shout out, “Rought on top field!” or “Rought on middle field!” We would grab our bags and run for the best viewpoint. Dave and I were just 16 months apart. One day on my way home from school, I saw some boys in a dusty scuffle and I realised that two of them had taken Dave on in a rought. I ran down the hill to the little grass verge in the middle of the road and climbed in. My little brown suitcase was my weapon and I made sure those boys felt it. Dave was furious that I had embarrassed him and we all had to appear in the Principal’s office the next day. Dave got caned and he took note of it in pen on the small space left on the back of his tie. I got away with having to write “I will not fight after school” 100 times. Writing repetitive lines never did make an impression on me. If Val didn’t know who did something, we would all get it. One time I got a hiding I didn’t deserve and my mom’s response was, “Well that was for all the times you didn’t get caught”. She always made sure whatever she used hit the target and she also made sure we couldn’t sit for at least a couple of hours. We never felt beaten up but she gave us something to remember. Dave somehow found out that dad kept his coins on the top shelf of his cupboard. We all plotted how we could get it to buy sweets. We closed the door and I was elected to be the spy. Sue held Dave’s legs and he reached up to feel for the money. We were all shaking. I heard footsteps coming down the passage and I panicked. I opened the door and shouted “Susan and David are stealing your money!” They got such a hiding and I stood outside the door pleading for dad to stop. I never got the job as a spy again. Mum believed we were good kids. She proudly told the children in the neighbourhood that she would give them a million rand if they ever heard any of her kids swearing. There were many knocks on her door with children saying, “Mrs Lowe, Linda said ^&$*#(@)*, or Mrs Lowe, David said @*#&$(#. Well, Val refused to believe them, so no-one ever got their million. Lin, I can’t believe you told that story, I have one that’s virtually a mirror image. My Mom left 15 cents on the counter once and the next morning it was gone. She lined all seven of us up and grilled us to find out who took the money and no one fessed up. Consequently, we had to stay in all day (it was a Saturday!) and clean the house top to bottom. All the while we were accusing each other throughout the day. The most ominous part was that Mom said, “Wait ’til your Father gets home!”. Finally at 6pm we were allowed to watch TV…… quietly. Dad came home and asked what the matter was. When Mom explained he said, “Oh, I took the change for some cigars!!!!! !” Mom’s response? “Well that’s for all the times I didn’t catch you doing something wrong!” Is that the first verse in the Westminster Parental Catechism?